4am. That's the time every morning that he wakes up. He cries out for me and I hear it over the monitor. Maybe he woke up scared, or bashed his knee off the crib bars again because we don't believe in bumper pads. Maybe he woke up and just wanted to cuddle, or have a drink of his bottle that I still let him have at 15 months old. Regardless of how he woke up, this is usually the time that I carry him down the small set of steps that separate his room from ours, and put him in bed with us. 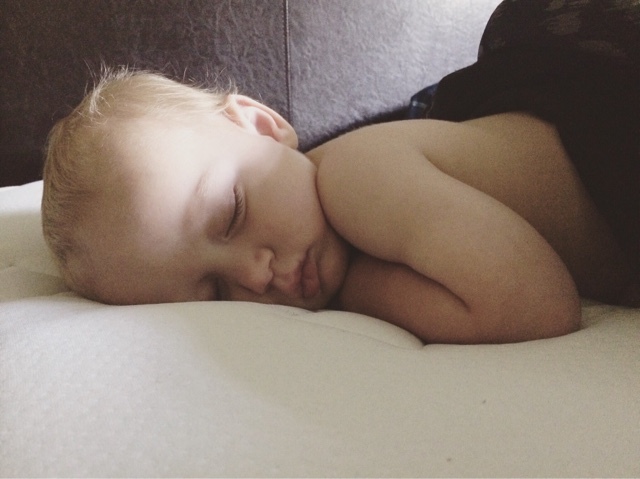 I never thought I would be the kind of mom to let my child sleep in bed with me EVER. That creates bad habits, and my children will be "good" sleepers (lol!). The truth is, I love taking naps next to him. He usually takes up most of the bed, and tosses and turns. He steals my pillow and kicks me in the face- but I love it. Moms learn to love weird things about their children. Just like I love how he always smells like sunblock and ritz crackers when he comes home from daycare. I can't get enough of that smell.